With this item you will earn 24 Points in Homespun Rewards! 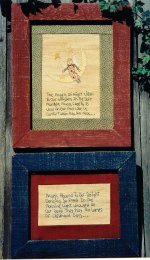 There a 5 fun little angels and sayings embroidered on these primitive pictures. Measuring approx 10" x 12"